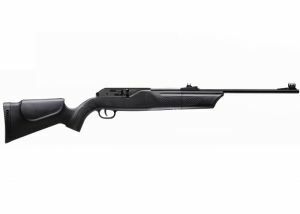 The "Umareks 850 Air Magnum" (Umarex 850 Air Magnum) is intended for training, recreational shooting and hunting small game. Initial speed of the ball, fired by this model is 175 m / s. With a single charge of the bottle with CO2, which weighs 88 g, can produce over 400 shots. The bottle is placed in front of the rifle under the barrel and is hidden from the stands. Stock is ergonomic handle and a polupistoletna called cheek. For filler used mini-drum, which is placed between the rear end of the barrel in a special slot. Can be used with optics, which are provided holes for mounting . price does not include optics!